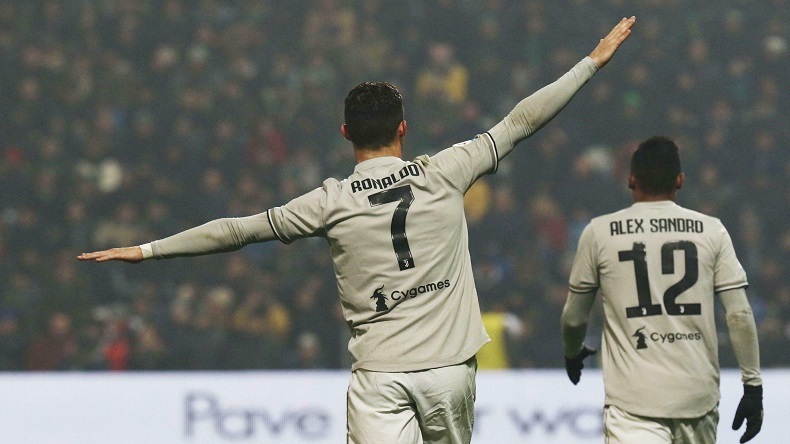 When Cristiano Ronaldo scored Juventus' second goal against Sassuolo on Sunday, he took his Serie A goal tally for this season to 18 strikes. It was his 20th goal of the season for the Old Lady of Turin. With the emphatic 70th minute strike, the 34-year-old made it 13 seasons in a row with 20 or more goals to his name. When Cristiano Ronaldo announced his departure from Real Madrid for pastures new at Juventus, many called it Ronaldo’s one final push to get a lucrative contract while labelling him an attacker way beyond his best footballing years. Fast-forward six months and the Portuguese icon still continues to prove that he is a force to reckon with when it comes to displaying predatory skills in front of the goal. When Cristiano Ronaldo scored Juventus’ second goal against Sassuolo on Sunday, he took his Serie A goal tally for this season to 18 strikes. It was his 20th goal of the season for the Old Lady of Turin. With the emphatic 70th minute strike, the 34-year-old made it 13 seasons in a row with 20 or more goals to his name. Such has been the former Manchester United attacker’s impact in Serie A that the club he plies his trade with is 11 points clear at the top of Serie A table and is yet to lose a league match in the current season. Furthermore, Juventus are one of the favourites to clinch UEFA Champions League this year and their odds are higher than any other team due to one sole reason – Ronaldo’s presence in the team. The 5-time Ballon d’Or winner is in astonishing form and looks all set to take away the top scorer award in Serie A by the end of this season. Only Fabio Quagliarella and Duvan Zapata follow him closely on goalscoring charts. Cristiano Ronaldo moved on from Real Madrid after a trophy-laden 9-year stint in which he scored an unbelievable 450 goals n just 435 appearances. He won two La Ligas and four Champions League crowns with the Los Blancos.